JP Morgan held the top rank in the latest M&A league table of the top 10 financial advisers for the information and communication technology (ICT) sector for FY2018, compiled by GlobalData, a leading data analytics company. The New York-based financial institution took the top spot with a total advised deal value of $236.4bn for advising on 62 deals—the second highest in the sector in 2018. According to GlobalData, which tracks all merger and acquisition, private equity/venture capital and asset transaction activity around the world to compile the league table, Morgan Stanley and Goldman Sachs stood second and third, advising on deals worth a total of $232.8bn and $206.9bn, respectively. The ICT sector witnessed a surge of over 69.38% in value from $400.9bn in 2017 to $679.1bn in 2018. Volumes too rose by 31.12% from 10,302 in 2017 to 13,508 in 2018. 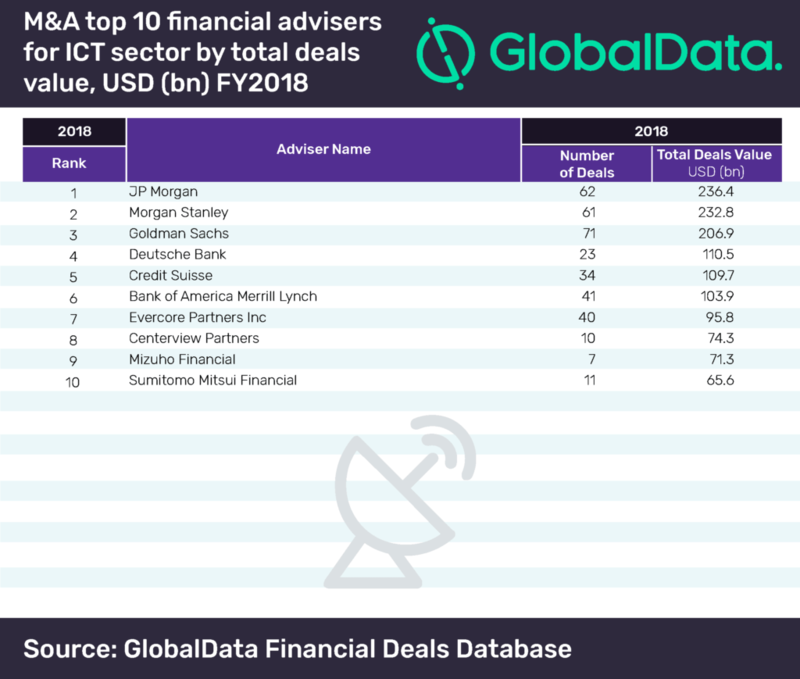 JP Morgan, which topped the ICT Deals league table, occupied second in the global league table of top 20 M&A financial advisers released by GlobalData recently. Goldman Sachs, which is placed third in the ICT Deals league table, ranked first in the global list. 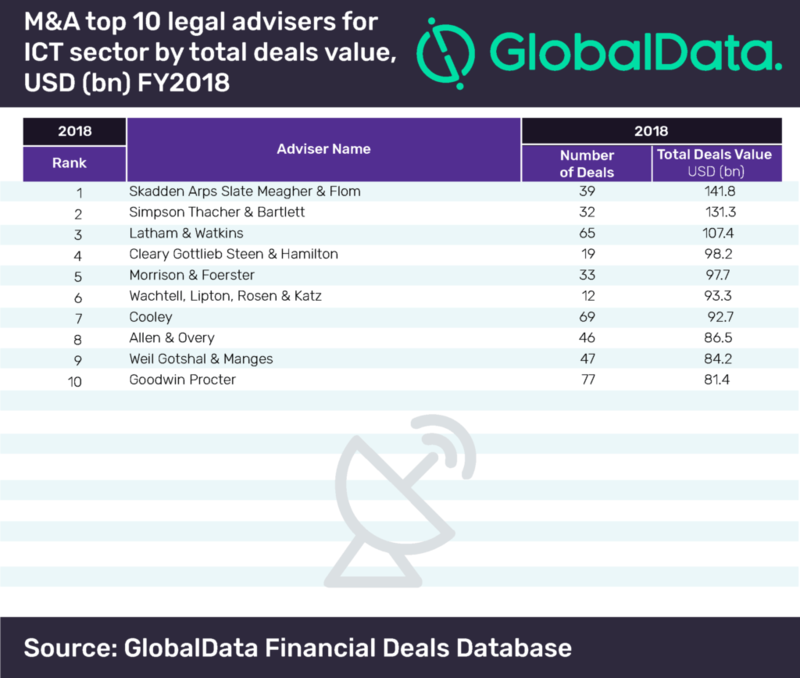 US-based law firm Skadden Arps Slate Meagher & Flom led the top 10 legal advisers table for FY2018 with a value of $141.8bn. Despite advising on the highest number of deals at 77, Goodwin Procter occupied tenth position with a value of $81.4bn. Skadden Arps Slate Meagher & Flom also topped the global league table of top 20 legal advisers for FY2018.